The FUN way to learn Bible Stories and lots more! Friends and Heroes brings the Bible to life! Boys and girls will be thrilled by the first-century adventures of Macky and his friends and their lives will be changed forever by the powerful Bible stories featured in every episode. SAVE 10% on any purchase of $50 or more! SAVE 20% on any purchase off $125 or more! Devotions the whole family will love! Based on Friends and Heroes exciting video adventures with life-changing Bible stories, this Family Devotion Pack provides everything you need for 26 dynamic, fun weekly devotions that will get the whole family involved! Plus, your whole family will enjoy the episodes on DVD for family viewing for years. Click here for more details about the devotion pack and to download a FREE devotion! No coupon codes are necessary. Your savings will automatically appear in your cart. 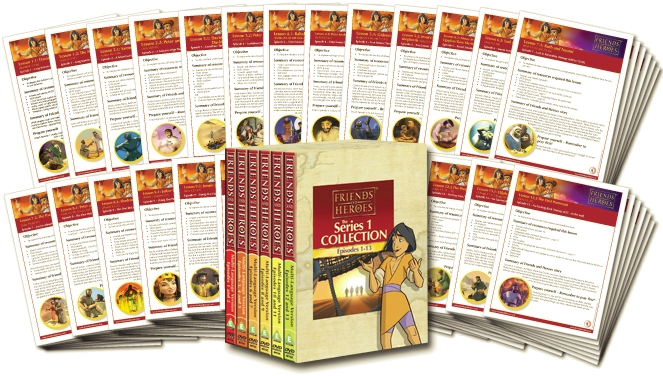 Every DVD features at least two Friends and Heroes episodes, in ten languages, plus exciting extras! These savings even apply to our Home and Family DVD Collections, each featuring 13 episodes on six DVDs in an attractive slipcase! You can browse the whole DVD collection here. New! Friends and Heroes Homeschool Bible Study is curriculum your children will want to use again and again! Based on Friends and Heroes thrilling adventures with life-changing Bible stories, this curriculum provides everything needed for a full year's worth of homeschool Bible study. Click here for all the details on our Homeschool Bible Study Curriculum and to download a free lesson! 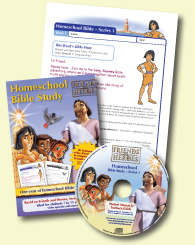 Friends and Heroes Homeschool Unit Studies are based on our award-winning animated adventures with Bible stories on DVD. Each unit study contains cross-curricular learning in a single all-in-one lesson pack - exciting, hands-on, easy-to-use, attractively designed, colorful and fun! 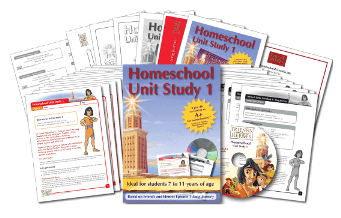 Visit our Homeschool Information Page where you can learn more, download free curriculum samples and view a video clip. Friends and Heroes Church and School Packs are based on our exciting animated programs and include a lifetime public display license and downloadable Bible lessons for churches or schools. You can download sample lessons, view a video clip and learn all about our Bible curriculum by visiting our information pages for churches and schools. We also offer Resource Packs for special occasions like VBS, children's outreach parties or Halloween alternative events. Don't delay. All the offers above end on February 4, 2019. For a limited time, you can enter for a chance to win a $50 gift certificate good for any purchase of $50 or more from the Friends and Heroes store. That includes all the great resources listed above. Don't delay, entries end January 28, 2019!